Depart Adelaide at 8.30am, arrive Waikerie midday. Check into accommodation and lunch at Waikerie Bakery. Drive to Gluepot, arrive 2pm, birding on the way in. Photography at TBC bird hide working on skills to achieve perfect exposure. Return to Waikerie for dinner at Waikerie Hotel and debrief. 5.30am depart Waikerie, arrive Gluepot 6.30am. Bird Photography walk on TBC tracks. 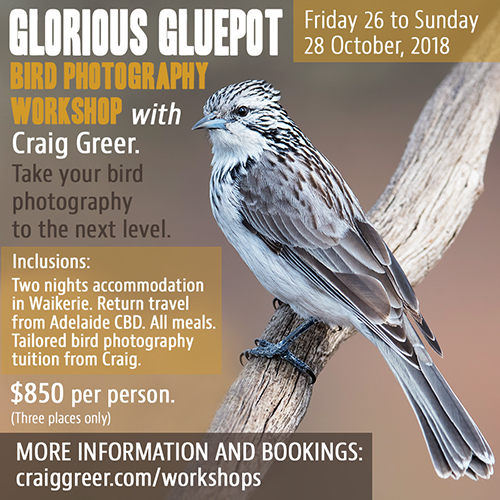 Find and photograph a range of Mallee species, focussing on field craft and getting into best position to photograph birds. Focus on getting sharp, well exposed images in the field. This session will include a short break for morning tea. Lunch, download, review and discuss images from Sessions 1 and 2. Photography at TBC bird hide, practising a range of skills including fill-flash, capturing fast action and recording video. Nocturnal session searching for Spotted Nightjars and Tawny Frogmouths on way back to Waikerie. Eat dinner at Waikerie Hotel. 6.00am depart Waikerie, arrive Gluepot 7.00am. Search for and photograph a range of Mallee birds, practising field craft skills, getting beautiful backgrounds and shooting in tricky light. Lunch, image review and editing workflow demonstration. 3.00pm – 4.00pm search for birds to photograph on departure from Gluepot and return to Adelaide by 7.30pm.